My boys just love Alvin and the Chipmunks as I did growing up. I love the tradition of listening to those crazy three squeaky voices. Granted in my adult years, I've distance from myself from their Christmas songs specifically because of a job I had a few years back (haha), I still think it's adorable watching the kids dance and sing along with them! I was sent over the Alvin and the Chipmunks: It's Show Time! to review for the holiday! The synopsis says, "Alvin, Simon, and Theodore put on their biggest show yet—a benefit concert to help the local animal shelter. The story is brought to life through 8 interactive sound prompts and full-color illustrations. A sweet story about working out differences and helping the local community." This one was adorable including three songs and two remixes. The kiddos loved reading along and pushing the buttons to animate the story as they went from page to page. It's even cuter watching them try to sing "I Told The Witch Doctor I Was In Love With You!" 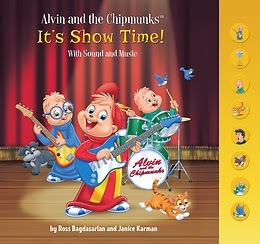 Giveaway: Running Press is going to give one of A Lucky Ladybug's lucky readers Alvin and the Chipmunks: It's Show Time! to have of their own! My favorite gift is the snow globe I got from my mother before she passed away. A few Christmases ago, I got two different leather coats that year, I was very surprised!